We’ve reviewed a few devices in the past that will charge your car battery as well as your phone. These products are very similar, but both very useful, so we’ll take a look at why you might want this product in your stocking this Christmas. This review is of the JumpSmart Jump Starter Flashlight Power Bank. 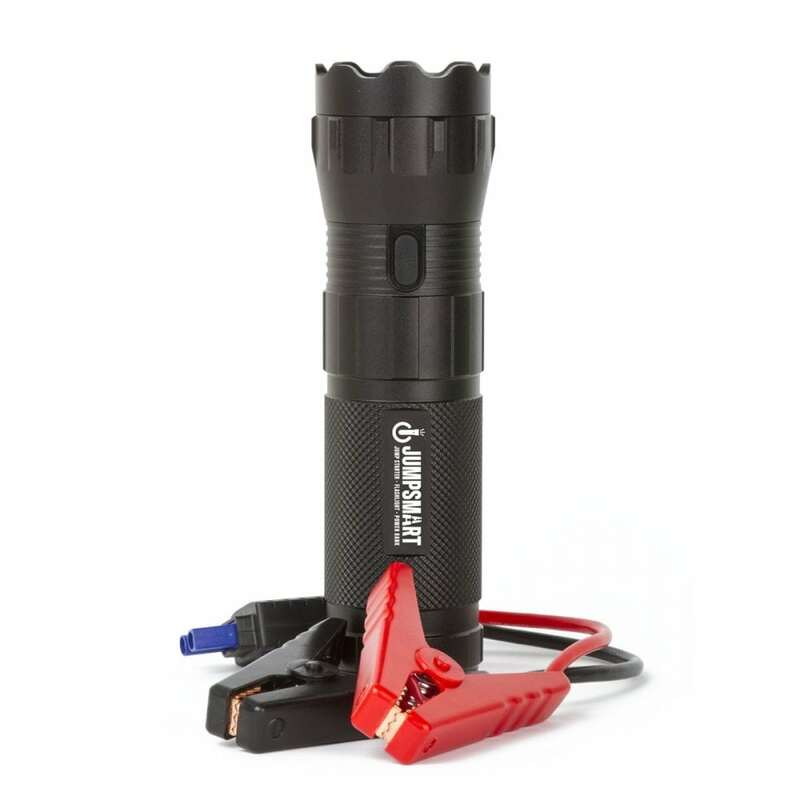 This flashlight casing is made of a very sturdy aluminum casing. There are four modes on the light which reaches 1100 Lumen that shines up to 150 meters. There are high beam, weak beam, strobe, and SOS Modes. The jumper cables include 10 built-in safety features- including an alarm that will sound and safety indicator lights that warn if you are not properly connected. The Lithium battery is 10,000 mAh / 37000 mWh. A 5V / 2.4A USB Port utilizes SmartSpeed technology to charge your phone or other devices. Opening the box reveals a handsome, well-built case that houses the flashlight. Also included is some instructions, and charging cables with wall and car adapters to charge the JumpSmart. Based on the research from this site, you shouldn’t leave your portable jump starter in your vehicle- especially if it’s extremely cold. The jump starter might not help you if your battery is completely dead, or has very low cold cranking amps. So it’s a good idea to bring this in out of the cold, and make sure that it is charged frequently. This device can be recharged 1,000 times, and suggests that you recharge it every 3 months at least. You really want it to be ready to go. If you want to purchase a set to keep in your car, or maybe a Christmas gift for someone you love, you can get them for $119.99.